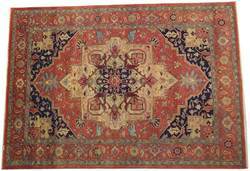 Heriz rugs reflect geometric renderings of Tabriz designs. This collection of hand-knotted rugs utilizes hand spun, over-twisted yarn that further enhances its appeal. The over-twist yarn gives a nubby feel to the rugs making them unique and interesting.